LS7 7.0L without ECM and Wire Harness - Seven liters of pure trouble maker! The king of all Corvettes is the amazing 2006 ZO6. It tops out at 198 mph, runs the quarter mile in 11.5 seconds at 127 mph, and hits 60 mph in a jaw-dropping 3.5 seconds (in first gear). All of that performance is the result of superior GM engineering and an engine we call the LS7—the most technologically-advanced small-block ever built. 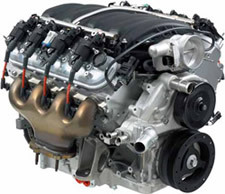 A natural continuation of the LS Family, the LS7 uses a 7.0-liter aluminum dry-sump block, CNC-ported cylinder heads, and titanium rods and valves to pump out 505 hp and 470 lb.-ft. of torque. Talk about efficient—the LS7 helps the 2006 ZO6 get over 28 mpg while still being the fastest Corvette ever produced! Is this the Chevy small-block in its highest form? Only you can decide, and GM Performance Parts has made it that much easier by offering the already legendary LS7 as a complete crate engine, ready to bolt into your favorite project car. 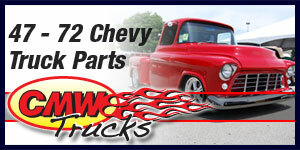 Anything that you want to have the baddest, small-block Chevy on the planet!